Datuk Seri G.Palanivel, Minister in the Prime Minister‘s Department and President, Malaysian Indian Congress on 29.11.2012. Shri Sathyanarayana Sarvey, Hon‘ble Minister of State, Road Transport & Highways, Government of India meeting Shri Sathyanarayana Sarvey, Hon‘ble Minister of State, Road Transport & Highways, Government of India with Senator Tuan Gan Ping Shou, Hon‘ble Deputy Minister of Youth & Sports, Government of Malaysia and other dignitaries at the Flag Off ceremony of ASEAN-India Car Rally at Putrajaya on November 28, 2012. H.E. Shri Vayalar Ravi, Minister of Overseas Indian Affairs of India with H.E. 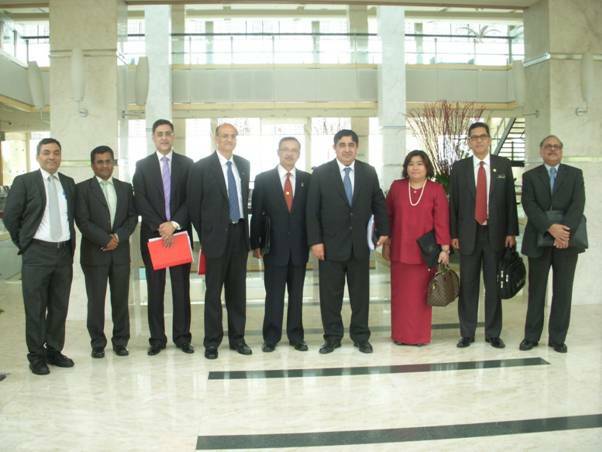 Datuk Seri Dr. Subramaniam, Minister of Human Resource of Malaysia during his official visit to Malaysia on November 26, 2012. Y.B.Dato‘ Sri Peter Chin Pah Kui, Minister of Energy, Green Technology and Water, Malaysia and Dr. Farooq Abdullah, Minister of New & Renewable Energy, Government of India exchanging the Memorandum of Understanding (MoU) in the field of Renewable Energy, signed in New Delhi on 07th November, 2012. H.E. Shri N.N. 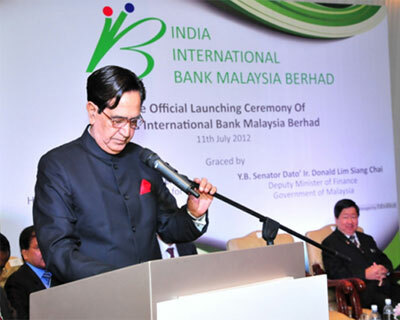 Meena, Minister of State for Finance of India speaking at the Launch of India International Bank Malaysia in Kuala Lumpur with H.E. Y.B. Senator Dato‘ Ir. Donald Lim Siang Chai, Deputy Minister of Finance of Malaysia in the background. Rear Admiral Ajit Kumar P, VSM, Flag Officer Commanding Eastern Fleet, during his courtesey call on, to Admiral Tan Sri Abdul Aziz bin Hj Jaafar, Chief of Malaysian Navy on 28 June 2012 at Ministry of Defence Malaysia. In the front row, on the extreme right- Shri R.K. Mathur, Secretary, Ministry of Micro, Small and Medium Enterprises (MSME); third from right - H.E. 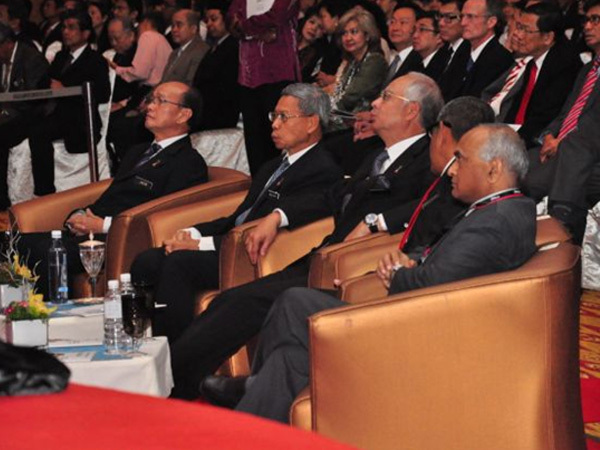 Dato‘ Sri Mohd Najib bin Tun Abdul Razak, Prime Minister of Malaysia; and second from left – H.E. Dato‘ Sri Mustapa Mohamed, Minister of International Trade and Industry (MITI) at the India-ASEAN SME Conference 2012 in Kuala Lumpur on June 21-22, 2012. 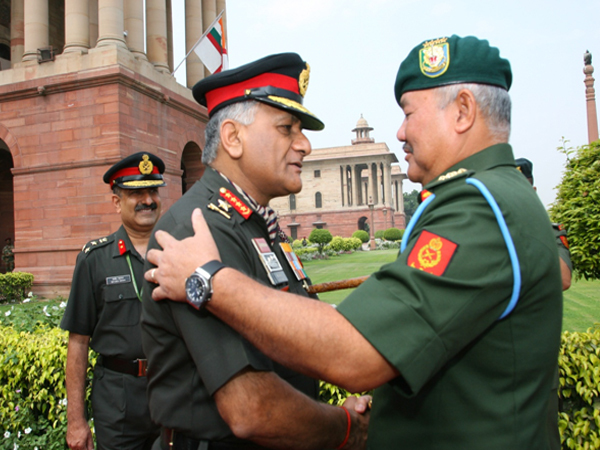 General VK Singh, PVSM, AVSM, YSM, ADC, Chief of Army Staff, India receiving General Datuk Hj Zulkifli Bin Hj Zainal Abidin, Chief of Malaysaian Army at South Block New Delhi during the official visit by Chief of Army , Malaysian to India on 02 April 2012. Admiral Nirmal Verma, PVSM, AVSM, ADC, Chief of Naval Staff, India presenting a memento to Admiral Tan Sri Abdul Aziz bin Hj Jaafar, Chief of Malaysian Navy during their bilateral meeting on 30 March 2012 at New Delhi. Mr. Satish Wagh, Chairman, Basic Chemicals, Pharmaceuticals & Cosmetics Export Promotion Council (CHEMEXCIL), Dato‘Mukhriz Mahathir, Deputy Minister of International Trade & Industry, Malaysia, H.E. Mr. Vijay Gokhale, High Commissioner of India to Malaysia and Dr. K.M. 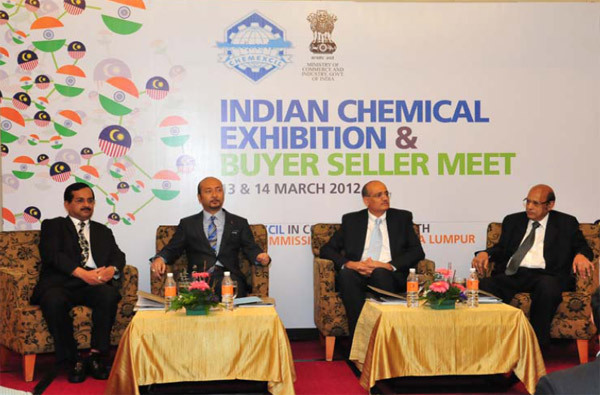 Shah, President, Indian Speciality Chemical manufacturer‘s Association at the inauguration ceremony of Indian Chemical Exhibition and Buyer-Seller-Meet at Corus Hotel, Kuala Lumpur from 13th to 14th March 2012. H.E. 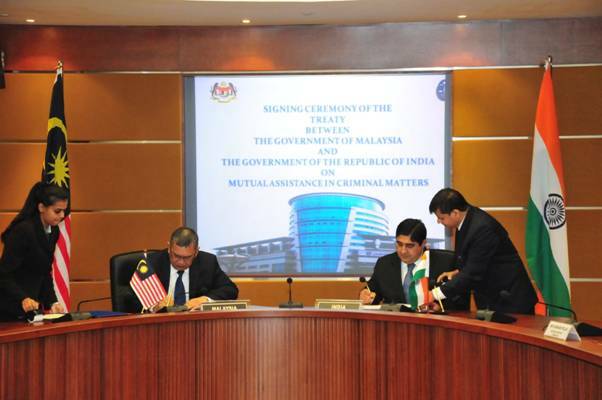 Mr. Sanjay Singh, Secretary (East), Ministry of External Affairs, Government of India and Tan Sri Abdul Gani Patail, Attorney General of Malaysia, at the signing ceremony of the Treaty between the Government of Republic of India and the Government of Malaysia on Mutual Assistance in Criminal Matters held at Putrajaya on March 12, 2012. H.E. Mr. Sanjay Singh, Secretary (East), Ministry of External Affairs, Government of India and H.E. Tan Sri Dato‘Mohd. 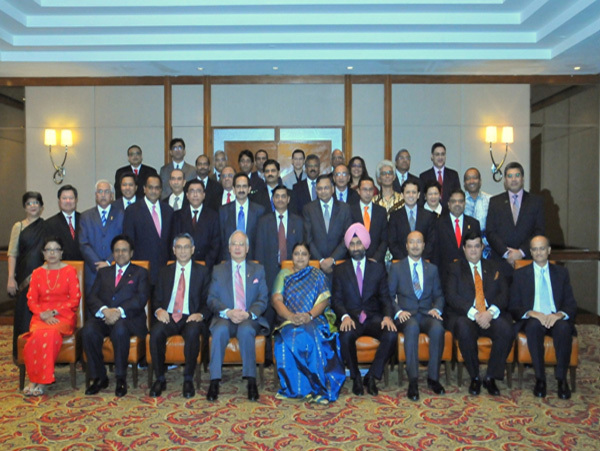 Radzi Bin Abdul Rahman, Secretary General, Ministry of Foreign Affairs, Government of Malaysia with the members of delegation at the 3rd Foreign Office Consultations between India and Malaysia held at Putrajaya on March 12, 2012. H.E. Shri Vayalar Ravi, Minister of Overseas Indian Affairs meeting H.E. Datuk Seri G. Palanivel, Minister in the Prime Minister‘s Department and the President of the Malaysian Indian Congress on February 27, 2012. H.E. Shri Vayalar Ravi, Minister of Overseas Indian Affairs meeting H.E. Datuk Seri Dr. S. Subramaniam, Minister of Human Resources of Malaysia on February 25, 2012. Air Chief Marshal NAK Browne, PVSM, AVSM, VM, ADC, Chief of Air Staff, India with General Tan Sri Dato‘ Sri Zulkifeli bin MohdZin, Chief of Defence Force Malaysia and General Tan Sri Dato‘ Sri Rodzali bin Daud, Chief of Royal Malaysian Air Force during his meeting with them on 02 February 2012 in Kuala Lumpur. Shri Shashi Kant Sharma, Defence Secretary of India exchanging documents with Dato‘ Sri Dr Hj Ismail bin Hj Ahmad, Secretary General of Malaysia during the 9th Malaysian-India Defence Cooperation Meeting held at Kuala Lumpur on 16 January 2012. H.E. Dato‘ Sri Mohd Najib Tun Razak, Hon‘ble Prime Minister of Malaysia and H.E. 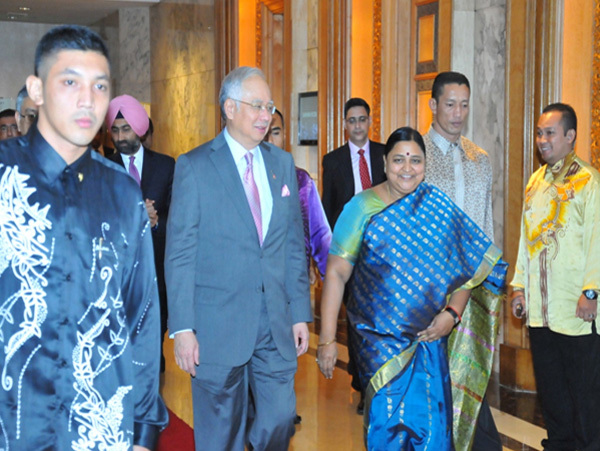 Smt Panabaka Lakshmi, Hon‘ble Minister of State (Textiles), Government of India arriving at the Gala Dinner. H.E. Dato‘ Sri Mohd Najib Tun Razak, Hon‘ble Prime Minister of Malaysia and H.E. Smt Panabaka Lakshmi, Hon‘ble Minister of State (Textiles), Government of India with other members of the delegation.